With the invention of high-resolution digital cameras and the mass adoption of social media, our dental practice is getting more and more people every year asking for secrets to how to get white teeth. There are many methods to getting the shade of white that you’re looking for. Consider the following, as these are reasons why your pearly whites may not be as white as you want. These gels contain hydrogen peroxide. They remove stains and make the teeth whiter. They’re usually applied by using a tray which you leave on for a few hours. As they are done at home they are not the ideal, consistent, safest teeth whitening method. These are strips that you put on your teeth and leave for a few hours. This can have varied results as often this strips can shift and leave the teeth unevenly bleached. 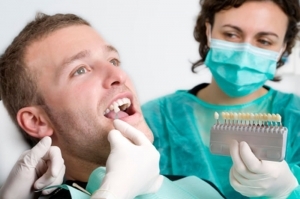 These are the lowest cost but the results are often not as desirable as visiting a dentist in office. This apparatus applies a bleaching peroxide to the teeth and are applied at will. Often times these produce mixed results as the application is uneven. The best teeth whitener is your local dentist! While also the most costly, the results are universally the best. Give us a call, we offer free consultations. The price will definitely vary. Depending on your age and on of the condition of your teeth, you can expect to pay around $500. In-office options are the safest. They protect the rest of the mouth including the gums from the harsh agents that are applied in the gel. Not only is our service for whitening safer, but we have years of experience in providing brighter shades of smiles for people all across Michigan. A veneer is a thin exterior sheet of thin material that covers a tooth that has been reduced in size. A veneer is used to cover a tooth that has been discolored by staining, lost attractiveness due to tooth decay, has suffered a crack or a break, or to cover up any other aesthetic issue. Veneers teeth cost can range from a few hundred dollars up to $700. Of course there is a economy of scale and the more teeth that you get covered with a thin porcelain sheet will improve the cost per tooth. The most comparable thing to a veneer is the dental crown. A dental crown is normally used if there has been severe breakage or if the tooth has been reduced to a very small size due to tooth decay or gingivitis. The application of veneers requires minimal reduction of the tooth and his much less invasive. Veneers are more fragile then crowns and caps, but do look more aesthetically pleasing. Before deciding one way or the other, we highly recommend that you come and visit us as our doctors will give you a consultative approach in deciding which option is better for your oral health. We look forward to meeting you and discussing all the options available to you!